William Harold Terry may search a long time before he stumbles across another such able replacement for the aging Travis Jackson as John Kelly Lewis, Jr. The manager of the New York Giants now realizes this, which is why he delivers himself one swift kick in the trousers practically every time he looks at a Washington box score, for - Bill Terry is charged with a $50,000 error in refusing John Kelly Lewis, Jr., 18 year old star of the Senators, $1000 for signing a Giant contract in 1933. Lewis returned to Gastonia, where he caught the eye of Norman (Kid) Elberfeld. The old infielded recommened the tall lyouth with the apple cheeks to his old friend, Joe Engle, presidnet of the Chattanooga club and one-man scouting system of the Senators. Cecil Travis was plucked out of an Augusta baseball school for $200. The school was conducted by the same Kid Elberfeld who put the finger on Lewis. 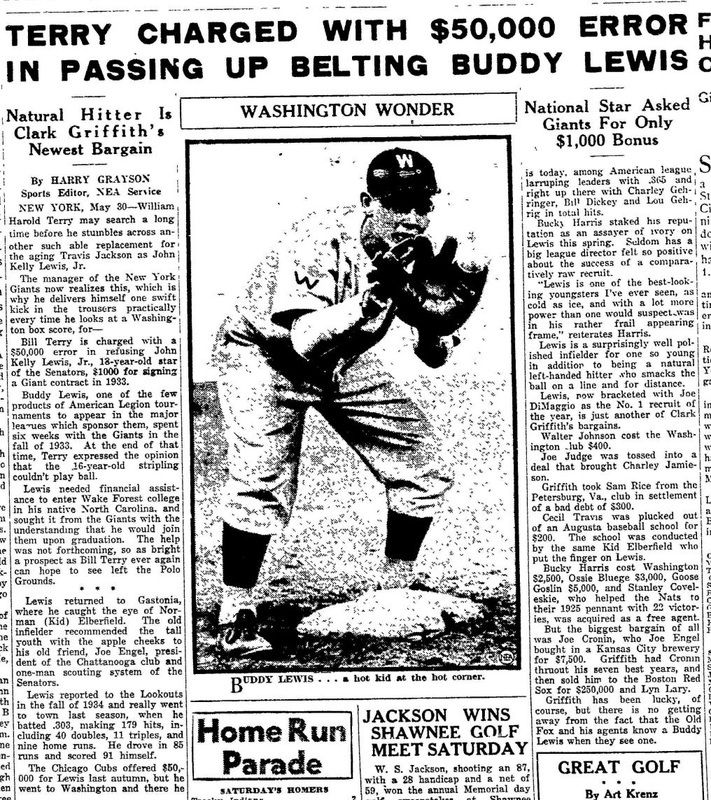 July 28, 1946 -The Des Moines Register, IA - Buddy Lewis and Jimmy Bloodsworth cost nothing although Engle shelled out $18.20 train fare to Lewis for transportation from Kid Elberfeld's baseball school at Atlanta.